The initial gift of deification, offered by the Living God to His cosmos and His beings, is so powerful that, at the end, created cosmos gave birth to Panaghia, the Mother of God, through Whom the Living, Uncreated Hypostatic God the Word was incarnated and became perfect man. Namely, He became the truly Messiah and the truly Savior of the world, visible and invisible. Thus, through Christ, created cosmos, the church in potency, becomes, indeed, Church in actuality. But, in order for something to be a church, it must primarily be Orthodox. That is, it must have a proper account (doxa) and theory (theōria) about God. Without proper account and knowledge of God we lie not only about God but also about man and the cosmos. God the Word became Flesh in Christ. Thus, the created world becomes, through the Virgin Mary and through the Apostles, body and part of Christ, and Christ and God by Grace. The world will host in it the One Orthodox, Holy, Catholic (universal) and Apostolic Church as the House of God the Father, and God the Son, and God the Holy Spirit. This is the Uncreated House of the One and Triadically hypostatic Living God, the truly Church of Christ. In the Church of Christ, the created is revitalized with eternal and immortal life, by entering into, abiding in, and developing within, the Uncreated God through His Uncreated and personally Divine Activities, in Jesus Christ the God-Man. Through His Personal, Divine, and uncreated Activities, God reveals Himself as Ecstatic Eros in Jesus Christ, the Son of Virgin Mary. He does so, in order for the cosmos to acquire and maintain truthful, immortal and infinite Life, truly free from any kind of corruption and restriction. That is why the Orthodox Eastern Church is the truly Holy, Apostolic and Catholic (universal) Church, because She is the truly House of the Living God, through Christ the God-Man. Here, in Her, the Living and Triadically hypostatic and Personal God is present. That is why, in the Orthodox Eastern, the truly One and real Church of Christ, abide neither infallible people, nor any kind of infallible, theocratic, metaphysical, philosophical hierarchies. Here we have the Living God Himself as Incarnated Word and Resurrected Word, Christ. That is, we have the Whole hypostatic and Trinitarian God, since Christ is all in all. Therefore, the Orthodox Eastern Church is the measure of any Church, any Orthodoxy, any Catholicity, any Apostolicity. It is the measure of every theology, Gospel, truth and holiness. For here, in His Church, Christ Himself, the Incarnated Word is present in His Bishops and Patriarchs, His Priests, and in all His faithful members; and through Him, the entire Holy Trinity is present. Here, the Monarchy of the Father and the Consubstantiality of the Trinity exclude any kind of hierarchy – whether ecclesiastic, or religious, feudalistic, anthropocentric or theocentric – since All the Holy Trinity is present in Christ and, through Christ, in the Church of Christ. ‘…And I am with you all the days to the end of the age’ (Matthew, 28: 20). It is for these reasons that, anything, whatsoever, that wishes to become Church in actuality, while being in potency, this ought to be truly united with the Orthodox Eastern Church, since the fullness of Divinity abides in Her, in Christ. For, if Eastern Church is not the truly One, Truthful Orthodox, Catholic, and Apostolic Church, then we lie to, and fool, ourselves. But we know in the Holy Spirit, that this is not so. We do know that we are truthful in Christ, when we acknowledge this fundamental and salvific Truth; namely, that the Eastern Orthodox Church is the Only truly Orthodox, and truly Catholic (universal), and truly Apostolic. That is, she is the measure of all truth and all Orthodoxy. We comprehend that Orthodox Theology and the Orthodox Church are not a human but a perfect and God-manly made Creation of the very God in Jesus Christ. It is a Creation that is not receptive of change, alteration, modification or amendment. Here, in the Orthodox Church, we do not come as scientists, in order to correct or change anything, whatsoever, according to seasonal perceptions, or other currencies. We are coming here in order to encounter with God Himself, in the person of Jesus Christ the God-Man. We approach in order to enter the Kingdom of Heavens. We do come here, in order to get to know, and to unite us with, Christ Himself, so that -through Him- we unite us with His Father and the Whole Holy Trinity. We come as dead to be resurrected in a Life Eternal and Truthful. Moreover, because the Church is the Church of Christ, she can but be One, Truthful, Orthodox, Catholic and Apostolic; for Christ is One, Truthful, Hypostatic and Living God, the One of the Trinity. Christ is the One Truthful God and truthful man. He is perfect God and perfect man. 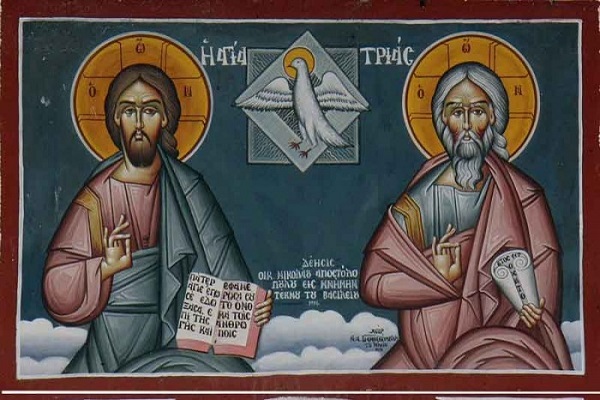 The Orthodox Church reveals to us that Christ the Word is perfect God, as the Father and the Holy Spirit. All the Three are one God, not hierarchical, but Personal and Hypostatic. For, wherever there is Person and Hypostasis, there is no hierarchy at all; only a Mystery of Freedom, Love and Life. There is nothing that can define and symbolize the Church apart from Christ the God-Man Himself. When it comes to the Church, it is valid that which applies for Christ: ‘come and see’. For Christ has no representatives; He reveals Himself in His Church, in His mysteries, in His Saint man and woman. No man can talk about Christ, let alone to demonstrate or reveal anything about Him, if not by Christ, in Christ and the Holy Spirit. Church is the place of Living God. It is where the Living, hypostatic and Triadic God calls -by means of His Divine Activities- beings from the non-being to the Being of His own Life. There where Love is Perfect, where Life is complete, and death has no power to defeat her. Therefore, we ought to confess, with boldness, courage, and true love, to all mankind that the Orthodox Church is the only Holy, Apostolic and Catholic Church, in which dwells all the fullness of Divinity.